If you've made the decision to heat with wood to supplement your existing source of home heat and reduce your overall heating costs, you're not alone. Many consumers are going back to the basics when it comes to home heating. However, there is now more choice when it comes to wood-burning stoves and the type of wood fuel you can burn to heat your home. There are two types of fuel when it comes to wood-burning stoves—firewood and wood pellets—and each work in different types of stoves. There is, of course, a traditional wood-burning fireplace, but when it comes to wood fuel, there are several other options as well. Compared to the traditional wood heat stove or fireplace, the pellet stove is really a different breed altogether. Although it can heat a home as well or even better than a wood heat stove, there are important comparisons to note before making your buying decision. When it comes to choosing between wood or pellet, it may come down to the actual stove itself. Wood heat stoves are available in free-standing models (with or without doors), fireplaces, fireplace inserts, wood cookstoves, and box heat stoves. The first pellet stoves introduced to the market were boxy and looked more like simple unattractive wood burners. However, their designs have been improved and in many cases, the average consumer would have difficulty telling them apart from a wood-burning heat stove. Pellet stoves are available with or without a viewing window. As for heating performance, a pellet stove is more efficient than an airtight stove or fireplace insert. Check BTU ratings when choosing a stove; the higher rating is best. Both types will produce a comfortable dry radiant heat. 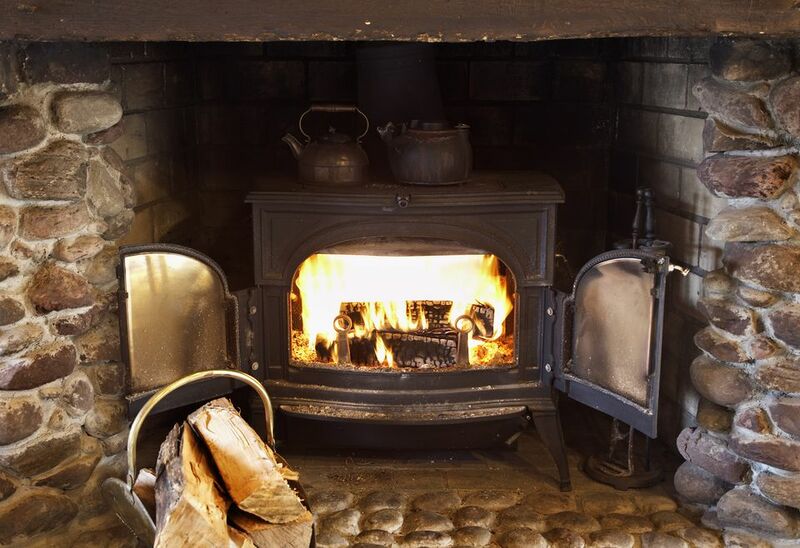 A pellet stove operates when the hopper is full and the stove can be thermostatically controlled, whereas a wood stove burn must be maintained to keep the heat constant. Initial costs for a wood stove or pellet stove are quite similar as far as the main unit is concerned. It's a matter of choice as to the style and design that appeals to you and choosing a size of stove adequate to heat your living area. Installation guidelines and codes are similar to either type of wood-burning appliance. But there are differences in connection costs. Wood heat stoves usually require a full insulated chimney system that must extend above the roof peak. Some pellet stoves need only a direct-vent or smaller chimney system which is cheaper and easier to install, thus reducing connection costs. When considering which type of stove to buy, it is important to assess the upkeep of each. Although both the pellet stove and the wood heat stove require regular cleaning and removal of ash, the ash volume is less with a pellet stove, as are the emissions. Since only pellet fuel is used in pellet stoves, there is no bark or wood chip mess to clean, and operation is clean and almost smokeless. Unlike wood heating stoves that can burn firewood and wood scraps, a pellet stove can only burn pellets, such as wood pellets or special fuel composites. As the cost and availability of firewood and pellet fuels will vary in different areas, you should compare the cost of a full cord of firewood and that of pellets and consider how long each volume will last in order to make a proper comparison. If a winter's supply of firewood is expected to cost you close to the value of about 3 tons of pellets, your operating costs may be similar with either stove. When it comes to storing firewood and pellets, there is also a difference. Firewood is usually stored outside, covered or not, while pellets must be kept in a dry place such as a shed, garage, or a room in the house. If you are still unsure of which direction to go, perhaps learning of some of the pros and cons of each type of stove will help you decide. If firewood is readily available and economical, and you don't mind the splitting, stacking, and wood/bark mess that comes along with burning wood, a traditional wood heat stove may be cheaper to install and operate. Even cheaper if you salvage free firewood. Pellets are sold in 40-pound bags which may create a challenge when carrying to the stove, while firewood can be carried in smaller batches if necessary. If you expect that firewood and pellet costs to heat will be similar, you can handle the heavy pellet bags and provide adequate storage, and you want a clean form of heating where you can set it and leave it for the day, a pellet stove would be a good choice. If your main concern is having a heating source during power interruptions, unless you plan on having a generator with proper electrical hook-up for the pellet stove, a wood heat stove would be best. In the event of a power outage, a pellet stove will shut down; pellet fuel stoves require electricity to operate. A traditional wood heat stove or fireplace will continue to provide heat during a power outage, and this may be an important consideration for your family. Also, some wood stoves have cooking surfaces which can be very useful during emergencies.